Curtis Jones (guitar & mandolin), Martin Norgaard (violin), Steve Mays (bass) and Dobbin Buck (percussion) played the main pavilion during the Bear on the Square festival on April 18th, 2010. The sound was incredible, these guys are fantastic musicians. Categorizing their music is impossible. There are so many different influences: jazz, blue grass, fusion, Spanish classical and the list goes on and on. Virtuosos all, they are all so talented and you have to listen to their sound to appreciate their musicianship and the level of talent these guys have. In the interest of full disclosure, all the music on my websites are original compositions by Curtis and back in late January of this year Curtis asked me to be his exclusive photographer; of course, honored, I accepted. Here are some shots of the guys at the main pavilion at the 2010 Bear on the Square festival. I will be adding more images over the next few days, so check back. Curtis Jones and I met in the square in Dahlonega Monday night. It's was a little late, both of us were just getting back to Dahlonega after busy days. We were going to grab a cup of coffee at the Crimson Moon and talk about some upcoming events, but we got there too late and they were closed. I had some gear and in the car and we decided to do a little shooting. It was dark, but I had an Elinchrom Ranger RX battery pack and a couple of heads. I didn't have my Octabank with me or any of the Rotalux soft boxes, so I shot this session with a shoot through umbrella as my key light and a 7 inch reflector with a 30 degree grid as my fill or rim light. The session was pretty quick, we shot for about 30 minutes and then went and grabbed some Mexican food at El Jimador and caught up. It was really good to see Curtis again, it has been a few months. He was touring in Europe and working on a new album. He is always working on a project and he formed a new band that will debut at the Bear on the Square festival; can't wait to hear them play. Al Di Meola, an awesome guitarist - if you're not familiar with his body of work you owe it to yourself to run, don't walk, to your nearest music store and give him a listen. Anyway, Francesco Cabras is Al's photographer and Curtis mentioned that he really liked the sharp edged quality of some of his portraits on the Official Website of Al Di Meola. Curtis is launching a new website soon and the images from this session may find their way to that site. Knowing that Curtis was interested in a more edgy style of image, similar to the images on Al Di Meola's site, I created these images. 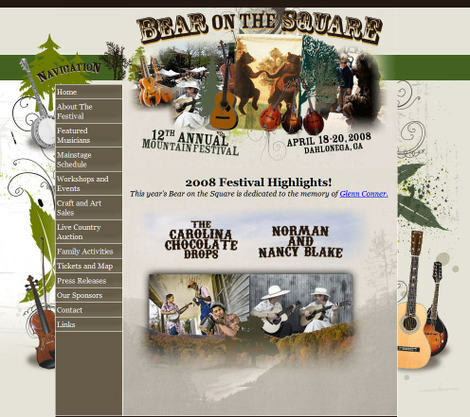 This weekend was the annual Bear on the Square festival in hometown of Dahlonega, GA. I called up my friend Dobbin Buck, the master of ceremonies for the event, and did a little quick coordination, gathered my gear together and off I went to shoot the musicians and the venue. It was totally awesome! First, the acts that played in the main event tent were fantastic; I mean, really fantastic. There was delicious food everywhere if you got hungry or thirsty and the town square was a seething organism of humanity. There must have been a dozen groups of musicians playing on every corner of the square. Literally, every twenty or thirty feet impromptu jam sessions were occurring. There were more guitars, banjos, fiddles and big huge bass guitars than you could shake a stick at. Vendors were selling instruments, mountain crafts, bottled and canned foods, lemonade, dulcimers, banjos, books; well you name it, it was there in abundance. But it was the music and the colorful musicians who came from all over that made this such a wonderful event. The weather was beautiful; blue skies with big puffy white pillow clouds floating by and plenty of sunshine and moderate temperatures. In a word it was glorious. I hope you were able to attend, but if not, I really wish you could have been there. However, since you might have missed it, I have put together a small slide show to share the experience with you. The slide show is accompanied by a wonderful piece of music from one of the performers in the big tent – Curtis Jones accompanied by his good friend from Denmark, Martin Norgaard. It's called Holly on the Mountain and I could not think of a more appropriate piece of music that communicates how I felt during the festival. The very last image in the slide show is the great Norman Blake, a legendary bluegrass performer. I was fortunate enough to be able to sit down at a sanctuary that had been set aside for the performers to warm up, the Dahlonega Community Center. While I sat and sipped a bottle of ice cold water, thanks Dobbin I owe you, I was able to listen in as his group warmed up and snap a few shots. Norman and his wife Nancy, Rachel Bryan and her father James went over a few tunes before the show and their music carried me away. It was beautiful that I almost forgot to pick up my camera and shoot a few images. It was a wonderful experience, almost a religous experience, and one I will never forget. Anyway, I hope you enjoy this small sampling of sixty images. I captured almost 1,500 images throughout the day and processing them will be a labor of love and a reminder of a very glorious day. Curtis Jones, Martin Norgaard, Holly Jones, Steve Mays and Dobbin Buck are the band Shamrock. They performed recently in Dahlonega, GA at the Celtic Music Festival at the Holly Theater. Here are a few images from the day in a slideshow with musical accompaniment by none other than Curtis Jones and Martin Norgaard. The title of the song is Landscape de Figuras, a beautiful piece that is a tribute to the late great artist Salvador Dali. These images were taken with my Nikon D3 without the aid of flash in natural light. Actually, there was not a lot of light; in fact, it was pretty darn near dark. Thank goodness I was shooting a Nikon D3; this camera continues to amaze me every time I use it in low light; it is just so capable. Honestly, I cannot think of another camera that can match its low light capability. There are a few that come close, the Fuji S5 Pro (another DSLR I own and shoot), Canon 5D, Canon Mark III and Canon Mark III 1ds come to mind, the max ISO of the Fuji S5 Pro and Canon 5D is 3200, for the professional Canon models it is 6400; the NIkon D3 goes two stops beyond – all the way to ISO 25,600. Great cameras all, to be sure, but I think I will keep my Nikon D3. Also, being able to shoot at 9 frames per second while capturing RAW files and 11 frames per second when shooting JPEGs is a real blessing in low light. Shooting a burst is much more desirable when your lens is wide open and your shutter is clunking along at 1/30 a second or slower; you will be tossing out a few out of focus shots. Getting these results under these conditions is a real testament to the camera; I will take any credit anyone would like to throw at me, but I have to fess up here and say, "Nikon did it." The majority of these images were taken at ISO 6400 and I was very satisfied with the quality I attained. Fast glass is a must, I did not shoot anything slower than f/2.8 and the 85mm f/1.4D AF Nikkor and 135mm f/2D DC-Nikkor lens made a world of difference. Of course, I would not have loved to have had a half dozen high powered flash heads positioned around the stage with all manner of light modifiers, but I do not think the audience would have appreciated my impact upon the performance. I was able to move around the stage shooting these images with minimal intrusion; although one elderly gentleman did comment about the sound of my shutter firing in burst and I obviously annoyed him. I truly regretted this, but my allegiance was to the band that I was shooting. I apologized to this polite man and moved out of his ear shot rapidly; hoping he forgave me. He was right, in the end, the purpose of the concert was the wonderful music and wonderful it was. If you ever get a chance to hear Shamrock or any of the members of the band play you owe it to yourself to take advantage of the opportunity.